Do you remember lunch? No. I don’t mean some limp excuse for a ham sandwich with a packet of cheesy Wotsits scoffed within 60 seconds hunched over your computer as Maureen from accounts complains that the photocopier cartridge needs changing. Nor do I mean sprinting like Usain Bolt for a takeaway bento box so that your breath stinks of wasabi during the afternoon’s board meeting. During my short tenure in the early 1990s, feigning work for an insurance underwriter in the City of London, lunch was like Oktoberfest crammed into two hours down the local boozer. Free flowing pints and rounds of steak sandwiches made sure you returned to your office a couple of pounds heavier...if you returned at all. Friday was often declared “POETS” - “Pissed Off Early, Tomorrow’s Saturday.” The weekend bugle blasted at 1.00pm and extended bibulous lunch dovetailed into cheesy disco and the last train home, hopefully, but not necessarily, going in the right direction. This ritual bound the British Empire together and was handed down from generation to generation until clean-living, health-conscious American companies took over the struggling industry. Aghast that their due diligence had failed to uncover that productivity nosedived after Friday noon, lunches were outlawed unless you wanted to go down the gym. What did Gordon Gecko say? Ten years ago this very subject cropped up on the Wine-Pages forum and a small gaggle of oenophiles decided that a rear-guard action was needed if “proper” lunch was to survive. WIMPS was born. For some reason, it is always written in capitals, although as far as I am aware it is not an acronym. I have long assumed it comes from the Gecko quote. WIMPS is quite simply an off-line for those that a) like wine b) want to share their bottles c) will not be fired if they return at 4.30pm reeking of Merlot. Nowadays most attendees take it as a half-day holiday. The inaugural WIMPS was held at The Ledbury in 2008. The restaurant had a friendly BYO policy and Brett Graham was just commencing his ascent to becoming one of the world’s most fêted chefs. WIMPS lunches soon became regular fixtures on the calendar and gained popularity to the extent that occasionally the entire restaurant is booked. As The Ledbury became a global destination restaurant, it was understandable that a bunch of noisy oenophiles quarrelling over brettanomyces in their 1981 Beaucastel led to its relocation to sister restaurant “La Trompette” in Chiswick. The tradition continues and there have been countless WIMPS lunches organized by Don (The Don) Reid. This one celebrated its 10th anniversary, the theme, Bordeaux. La Trompette, established 2001, used to be a good local restaurant but lagged behind others owned by Nigel Platts-Martin, such as Chez Bruce, The Ledbury, The Glasshouse and The Square (the latter since sold and frankly a pale imitation of what used to be one of the capitals finest restaurants.) Located in Chiswick in West London, it literally lies round the corner from Hedone that Antonio recently reviewed. Refurbishment in 2013 saw La Trompette shut its doors and reopen with more ambition. Rob Weston, who had worked at La Gavroche and subsequently as Phil Howard’s right hand man at The Square for 15-years, took the menu to a completely different level. I am probably not the only person opining that La Trompette is the most consistent, well-priced, Michelin-starred restaurant in London and I say that as someone who has eaten there 30 or 40 times. Rob is the antithesis of the limelight-grabbing celebrity chef and despite being a regular, I cannot remember ever meeting the elusive man, who is clearly content behind stove. The restaurant is imbued with a local ambiance, a leitmotif throughout all Platts-Martin’s empire. It has a modern, clean-looking interior, the facade virtually one huge window looking onto Devonshire Road, tasteful artwork adorning the white expanse of wall, one side occupied by a semi-private room where yours truly can often be found. Like all of Platts-Martin’s restaurants, the staff are top grade, unfailingly welcoming and professional, and the sommelier team first class. They have to be considering that on occasion I have seen them handling 30 ancient vintages or 300 glasses or 40 demanding WIMPS-goers. 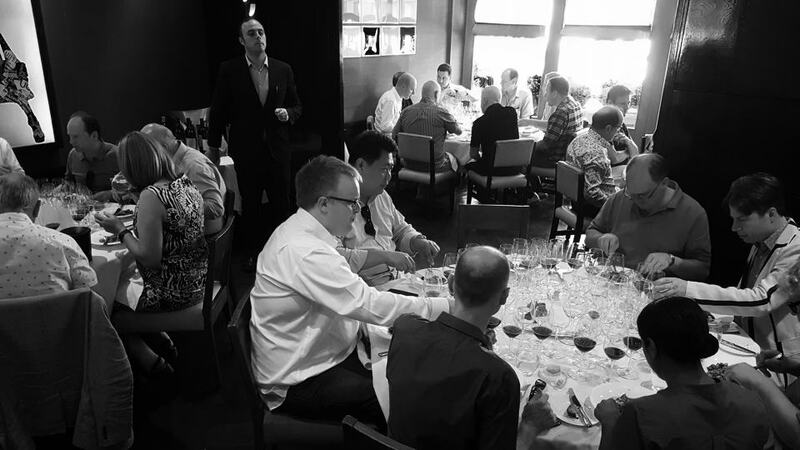 With 40 famished oenophiles in attendance, you could look at it as a very posh school lunch mixed with the feeding of the 5,000, although Jesus probably didn’t serve Yquem at the end of the meal. Maybe the details was just missed out of the Bible? We began with a plate of mouthwatering foie gras on a rectangle of brioche with redcurrant, as delicious as it sounds. I had to resist popping two or three in my mouth. 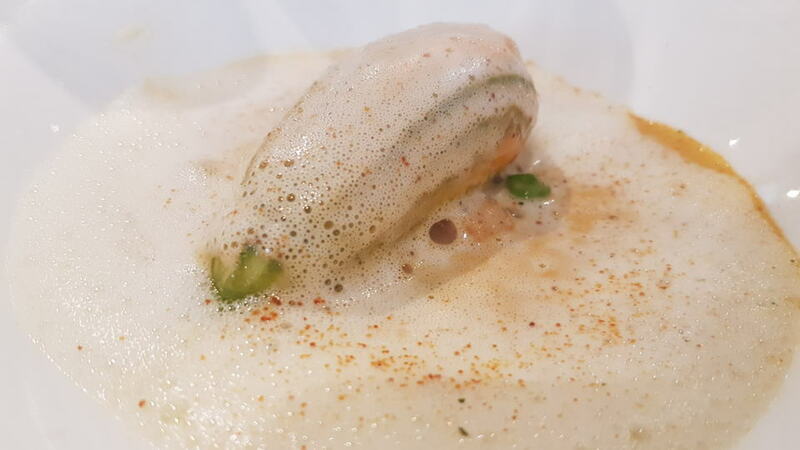 This was followed by a delicious wild trout mousse, sculpted like a quenelle and tucked inside a courgette flower with verbena, all wallowing in a light lobster foam (pictured above). The mousse was perfect in terms of consistency, almost light and airy. It must have taken hours carefully wrapping them inside 40 courgette flowers but this dish worked perfectly. 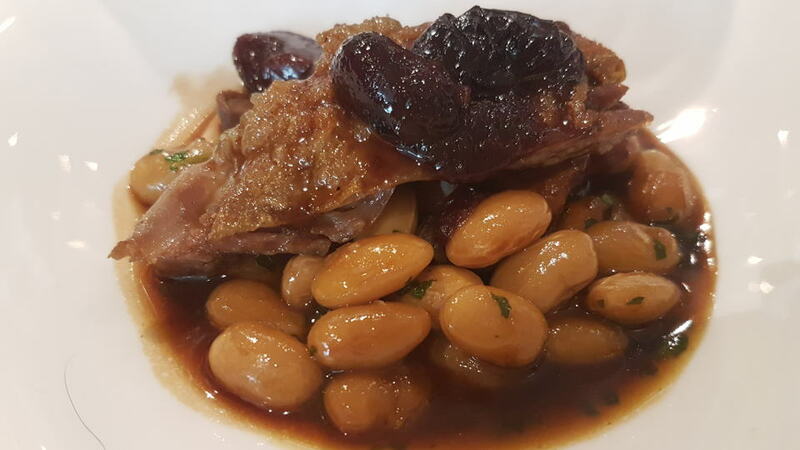 The confit of duck with Borlotti beans, girolles, red cherries and turnip worked well, although I felt the cherries were a little sharp and I would have swapped them for a more subtle flavoured fruit. The duck was perfectly cooked, as it always is here, the Borlotti beans lending complementary texture and the sauce reduction obliged mopping up by the consistently excellent bread. 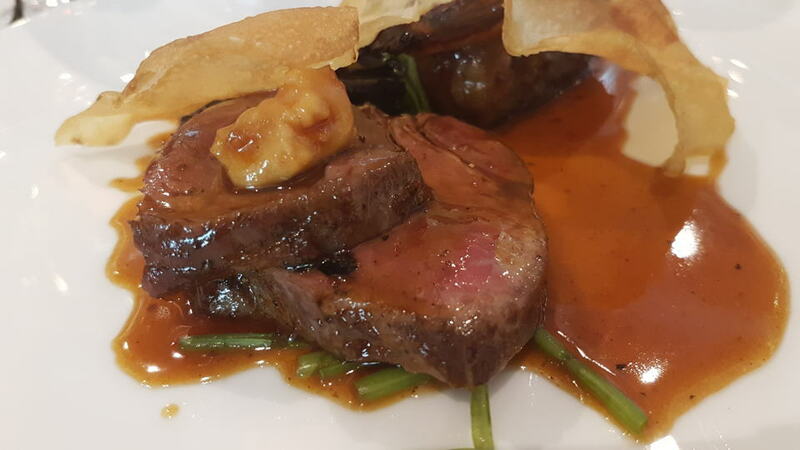 The canard was quite filling and thankfully there was quite a gap before the boeuf à la Bordelaise that was served with spinach and a lovely crisp potato wafer. The morsel of melt-in-your-mouth slow cooked rump was an absolute joy, the short rib succulent and (again) perfectly cooked and seasoned. 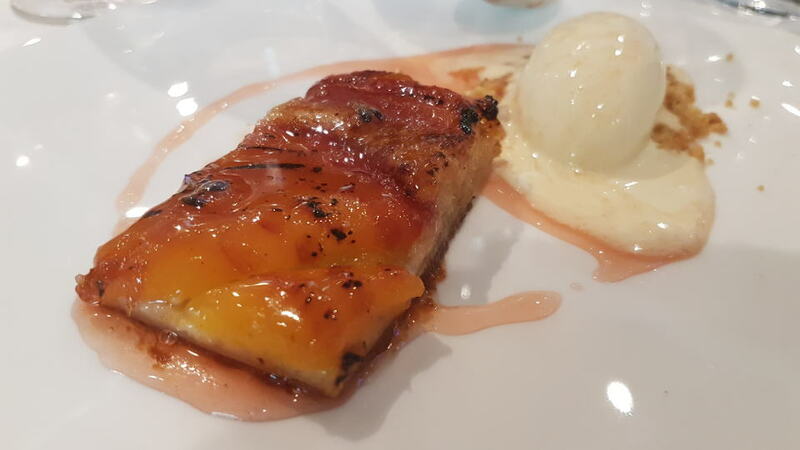 The best was saved to last: a stunning nectarine tarte fine with Souci ice-cream. Absolutely perfect in every way, the nectarine provided just the right amount of sharpness to offset the ice-cream that doubtless tasted twice as delicious as it would normally on this balmy summer’s day. I just adored the thin crust of flaky pastry that meant there was absolutely no heaviness to this dish – just everything in perfect balance and harmony. Finally, plates of warm caneles were dispatched from the kitchen, although I was completely full by this time. Since this Sceptered Isle is amidst and unprecedented hot summer, the 2008 Brut Rosé from Louis Roederer goes down as an absolute treat. Frankly, it is one of the best rosé Champagnes out there. Pale salmon in colour, it sports a glorious bouquet of light red cherry and citrus fruit, quite steely at first but then developing with very subtle creamy notes. The palate is just beautifully balanced with perfectly judged acidity and a precise, pretty, mineral-tinged finish with hints of nectarine and strawberry. Everything in this 2008 is so detailed and elegant that it begs the question: why pay more for a grander label? The 2010 Château Brown Blanc is quite deep in colour for its age – burnished straw in hue. It has a generous if slightly obvious nose with tropical fruit and a pronounced new oak although that should be assimilated within a couple of years. The palate is balanced, rounded in texture, perhaps veering a little too much towards a New World style instead of Pessac-Léognan compared to other vintages I have tasted, but satisfying all the same. The 1995 Domaine de Chevalier Rouge is a good but perhaps not great wine from Olivier Bernard. Now at 23-years of age, it remains surprisingly backward, almost sultry on the nose, whereby the oak feels a little too prominent for its age. The palate offers dense red and black fruit tinged with hickory that becomes pronounced with aeration. Firm in grip, it has a rather hard and atypically charmless finish that in this instance is shown up by its 1989 counterpart. Give this another three or four years if you can. The 1989 Domaine de Chevalier Rouge is a vintage that I have encountered several times previously and certainly has more charm than the 1995. Quite deep in colour, it has a winsome bouquet with black fruit, warm gravel, black truffle and smoky notes, becoming increasingly animally with time. The palate is medium-bodied and actually reminded me of the 1989 Haut-Brion, albeit without the same structured and depth. Notes of raspberry preserve, veins of earthiness with leather and cedar towards the finish, this is probably now à point. It is not quite the best bottle of the 1989 I have drunk, yet it remains a really lovely Domaine de Chevalier. The 1998 Pape-Clément Rouge is a wine that I rounded on in my overview of 1998s although this bottle expresses less of that green trait I noticed before. It has an overtly sumptuous and decadent bouquet that smothers the terroir expression, although it develops purity with time. The palate is laden with rich black fruit, cassis and vanilla, the winemaking more vocal than the terroir or personality and as such, I find this rather betraying the essence of what Pape-Clément should be. Thankfully, a change in approach has seen vast improvement in vintages since this was made. Three older bottles next. The 1966 Haut-Batailley is a wine that I have not tasted previously, indeed, venerable bottles of this Pauillac, recently purchased by the Cazes family of Lynch-Bages, are not that common. This offers classic graphite-tinged, slightly rustic black fruit on the nose, hints of brown spice and leather, still vigorous after 52-years. The palate is underpinned by slightly firm tannins, a fine bead of acidity and excellent balance. It translates the rather masculine nature of the 1966 Left Banks but there is so much freshness on the finish you can overlook that. It is a fine mature Haut-Batailley that might not win any “Wine of the Night” vote – but it is thoroughly enjoyable. Drink bottles now, although judging by this example, it will give another decade of pleasure subject to provenance. The 1966 Vieux-Château-Certan was unfortunately oxidized, which seems to be rather common apropos this vintage, though I include here another tasting note from a recent dinner. It is fully mature on the nose with scents of game, warm gravel and cigar box notes. It misses the fruit intensity of say, the 1961 or 1964 Vieux-Château-Certan. The palate is medium-bodied with rustic tannin, like previous bottles just a little smudged in the mid-palate with the Cabernet Franc imparting a slightly attenuated savory finish. Bottles should be consumed in the near future. The 1978 Talbot is a vintage that has escaped my palate until now. At four decades it has an attractive animally, dried-blood and sous-bois tinged nose that you could almost mistake for an old Rhône! The palate is well balanced with a fine bead of acidity, touches of black pepper and tobacco with an “old school”, light but fresh finish. It is a very classic old Saint-Julien but fair dues – this Talbot seems to be holding up well still giving pleasure. Let’s remain in Saint-Julien. The 2001 Léoville-Barton is drinking extremely well at 17 years of age. Mellow on the nose with blackberry, sage, tobacco and light graphite notes, there is an uncommon extravagant edge to this wine. That comes through on the palate that feels as if it has slightly lower acidity than other vintages, rounded in texture with a toasty, cedar-infused finish. It does not quite have the breeding that I discerned a decade ago but it still has plenty to offer, not least a sense of approachability. The 1995 Bel-Air Marquis d’Aligré is the same bottle that owner Jean-Pierre Boyer handed me when I asked whether I could taste an older vintage, so I wanted to share it with friends to gauge their reaction. As I expected, it is such a sui generis that it does not enrapture upon serving (after a two hour decant). Similar to the previous bottle it has an almost Burgundy-like bouquet without so much of the pressed violet character. Structured with touches of iodine, it misses a little cohesion and depth at first but comes together after an hour with a slightly saline finish. 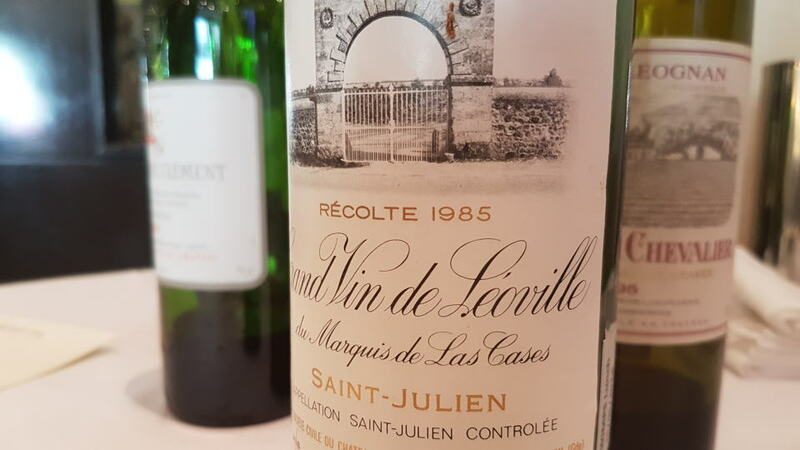 The 1985 Léoville Las-Cases is quite simply one of the finest Saint-Julien wines of the decade and over a dozen encounters have reaffirmed this as the most pleasurable Las-Cases ever made. This is a stupendous bottle, perhaps the best that I have ever encountered. It has a brilliantly defined bouquet that soars from the glass: red berry fruit, crushed stone, pressed flower, a hint of blood orange and woodland aromas. You could nose this all day. The palate is medium-bodied with the depth and structure one expects from this Second Growth. But what the 1985 has in spades, a virtue not always found at this address, is charm. Silky smooth in texture, the pure red fruit seduces the sense with a shimmering sense of energy on the finish. It is drinking now after three decades and based on this showing could give another three before it declines. We finish with two Sauternes, or more accurately one Barsac and one Sauternes. The 1988 Coutet actually shows better than the bottle I tasted at the estate back in 2010. Quite pale in colour for this vintage, it has a quite attacking bouquet of dried honey, fig and quince, just a hint of barley sugar in the background. The palate is lightly spiced with a dab of ginger on the entry, expressing impressive weight in the mouth with Coutet’s trademark acidity lending tension all the way through to the finish. The 2004 d’Yquem is almost identical to the bottle that I tasted at the château four years ago. It has a generous bouquet; the oak a tad more subsumed since my last encounter, with generous lemon curd, dried honey, mango and Mirabelle aromas billowing from the glass. It is a well balanced and quite weighty d’Yquem with slightly lower acidity than its peers; viscous in texture with a tropical tinged finish that I maintain just lacks the tension and energy of a d’Yquem from the top-drawer. Over the next months you will read many tastings that have taken place at La Trompette. It is a testament to La Trompette that, despite having dined there countless times, I still look forward to entering its doors. There is always one dish that takes me by surprise, one dish that is so delicious I want to dive into it. Not served at this dinner, but two weeks earlier at a Drouhin Musigny vertical, the black truffle tagliatelle was perhaps the finest dish I have ever encountered here – to die for! Perhaps for some visitors to London La Trompette is not central enough – Chiswick is located some 30 minutes on the tube in West London, but it is definitely worth a visit and in any case, with such reasonable prices, any taxi fares will be offset by the money you save on the bill (£37.50 for 3-course lunch, £57.50 for 3-course dinner). The wine list is broad and comprehensive, with not so many expensive icons, but thoughtfully chosen with plenty of gems. The 10th anniversary WIMPS lunch was still going strong at around 4.45pm when I left. It had been the usual mixture of old and new faces, the usual banter and laughter, the usual making excuses to explain to wives (regrettably attendees are almost exclusively male, though thankfully not entirely) about why a lunch can last five hours. Like many, it has been a place where friendships have been forged, bonded by a love of wine. Over the years I have tasted many wonderful bottles at WIMPS and those that come – you will read about them here in Vinous. As long as we have restaurants like La Trompette willing to cater for the demands placed upon the kitchen and staff, the tradition will continue and “proper lunch” will survive...even if we don’t continue on to a cheesy nightclub and the last train home.